Last Thursday, the Federal Communications Commission (FCC) passed a vote to end the Open Internet Order, a 2015 Obama Administration ruling designed to preserve Net Neutrality through legal classification. The FCC vote was received with shockwaves that reverberated across the internet...and the darknet. The media and press coverage of “Net Neutrality” has been a somewhat circular discussion, leaving many unsure of exactly what this term really means. Put simply, Net Neutrality implies an internet that enables and protects free speech. It suggests that Internet Service Providers (ISPs) such as Comcast, Verizon, and AT&T, should provide customers with open networks and should not block, limit or discriminate against any applications or content that comes across those networks. The core purpose of the Open Internet Order of 2015 was to clarify sections of the Communications Act of 1934 established during the administration of President Franklin D. Roosevelt, long before the internet even existed. The Open Internet Order of 2015 classified broadband internet as a utility-like tool for communication - similar to a telephone - which is referred to as Title II common service (see sidebar for more). The FCC vote on Thursday recategorized ISPs as an "information service," or Title I. By classifying it as an information service, ISPs can now deliver whatever content at whatever price or bundle they see appropriate without any oversight or legal authority from the FCC. Congress could easily overturn the FCC’s net neutrality ruling by passing a resolution of disapproval under the Congressional Review Act, if a majority of the House and Senate voted for it within 60 legislative days. However, given the timing of the holidays and the fact that President Trump favors the FCC’s vote - and has veto power to force a two-thirds majority of each house to override his decision - overturning this within the 60 legislative day timeline seems highly unlikely. The advocacy groups Demand Progress, Fight for the Future, and Free Press Action Fund announced their campaign to push lawmakers to repeal the ruling just after the vote came in. There are rumors that lawsuits are in preparation to sue the FCC, although it’s unclear what the grounds for such a lawsuit would be. Redditors’ comments have ranged from sheer panic (as if this is the beginning of the apocalypse), to preparing petitions and canvasing signatures for FCC Chairman, Ajit Pai’s resignation. Most recent comments were submitted in response to an encouraging post about how we should have faith in how our laws work and hopeful reports that House Democrats are preparing to repeal the ruling via CRA. The darknet has had a less than favorable outlook in response to Thursday’s vote. Darknet chatroom chatters have commented on noticing a change in their tor reliability and speed since the vote, despite the fact that ISPs are not legally allowed to violate the Open Internet Order until September 2018. However, it is well known Comcast and other providers have been guilty of blocking and surreptitiously interfering with high bandwidth services in the past, such as the Bittorrent case in 2008. Although also, to be fair, Comcast has also stated publicly that it doesn't manipulate traffic like tor and VPNs. Several tor users have discussed shifting to I2p in lieu of the FCC decision, but more disconcerting is the appearance of new Hidden Services which encourage a more radical and anarchist approach to defy the ruling. 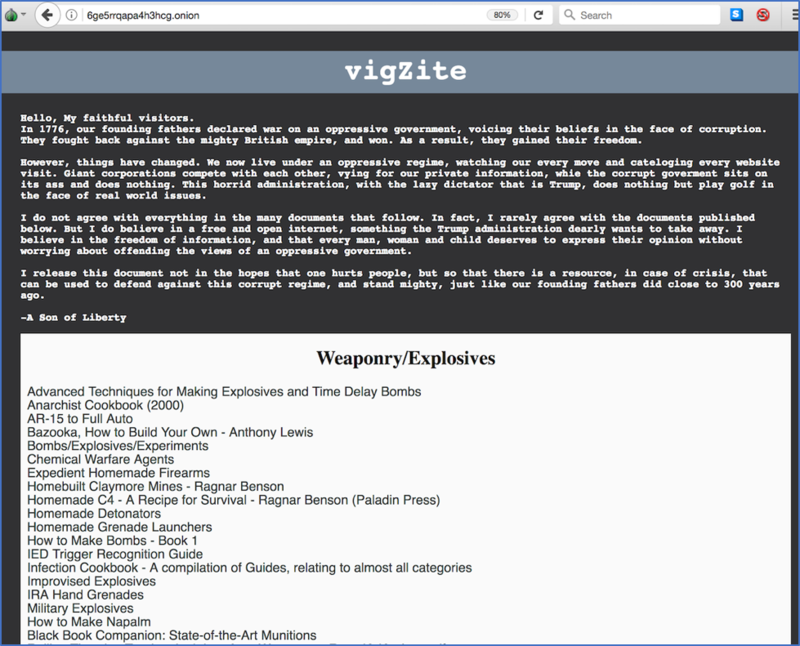 On 17 December, a Hidden Service titled "vigZite" (pictured) appeared, on which the sites creator “A Son of Liberty” compares the current state of affairs to the oppressive government our founding fathers fought to break away from in 1776. While there is quite a bit of fear mongering on the darknet about the possible interference with darknet proxies such as tor and I2p, comparing the ruling to China’s censorship of the internet, other darknet enthusiasts had a much more rational and logical approach. One user, who goes by the name “WickedX” reminded forum readers (pictured below) that this vote only affected US networks and that it is in the ISP's best business interest to keep customers happy by avoiding content favoritism or throttling that could potentially drive customers to other internet providers. We predict that with the ruling and the possibility of throttling and or content filtering by ISPs, many surface net users will likely shift over to tor and similar darknets for their regular internet activities. Using a virtual private network (VPN) or proxy service in combination with the darknet proxy will be needed to avoid the ISP detecting use of services such as tor. Also worth noting is that tor and I2p could experience a surge in users and more bridges will be needed to support the load. Usage metrics on the tor Metrics site (pictured) suggest this shift is already occurring, with numbers showing an unprecedented increase of almost a million relay connections since the second week of December, doubling the number of tor connections since the beginning of the year. Alternative explanations for the increase in tor client connections are that a new botnet has come online or that tor has more accurately counted client connections over each 24 hour period.